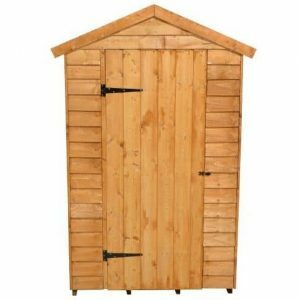 The Hartwood 6′ x 4′ FSC Overlap Apex Shed is a very attractive storage shed that is going to offer you a fair amount of storage space to make use of. This is a structure that has a very modern style, but as well as this it has that classic shed look which British sheds are known for. 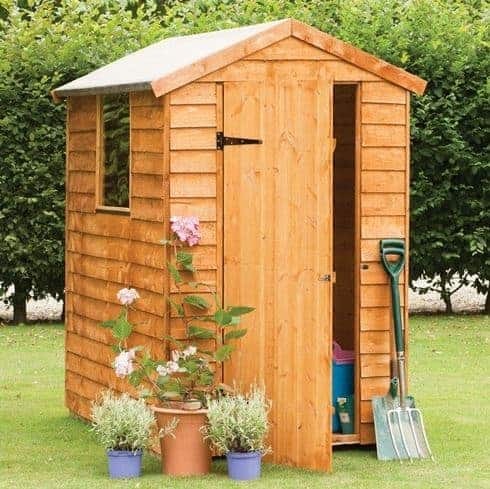 With a well designed door and one small window, this is a shed that really will look great in your garden. Due to the design as well as the generous amount of floor space that is at your disposal, you could always add some shelving to really maximise the amount of storage space you have. 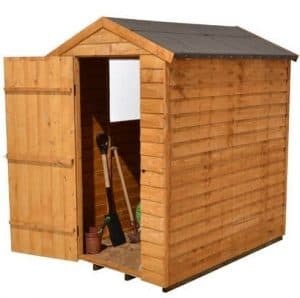 Even though this is a shed that is coming in at well under £200, it is still made with some very high quality materials. To start with the flooring is given extra support thanks to the pressure treated floor joists, these are going to enable you to store many heavy items in here. The walls are not just pleasant to look at they are also very strong thanks to being 8 mm thick overlap cladding. The window that is located on the side of the shed is not only going to let in natural light it is also made so that it is shatterproof, making this shed safe if you have children playing in the garden. 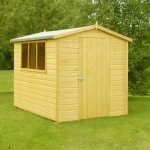 The Hartwood 6′ x 4′ FSC Overlap Apex Shed is a very well made and good looking shed that offers far more storage space than the 6 x 4 in its name suggests. 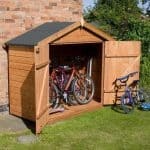 The shed is just a hair over 6 feet wide and it is 4 feet 3 inches deep, which we do know does not sound like a whole lot, but for the average family or just a person looking for that little bit extra storage space this is more than enough. Plus as the eaves height is 5 feet 4 inches, you could use some shelving on the walls which will really enhance the amount of storage space you have. 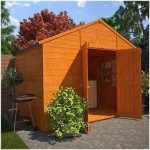 This is not just a shed that is offering a practical storage solution it also has a great look that makes this something you will be proud to have in your garden. They have gone for an apex roof for this shed and this we feel was a very smart decision. To start with you have no worries about the rain getting in through the roof as the water will always run off the roof. They have used some impressive solid shoot boarding and covered this with some very nice looking sand felt. This has a very, dare we say, rustic kind of look to it and that is because of the overlap cladding they have used. We really like this style of cladding as it is something that is never going to go out of style and as it is 8 mm thick when the kids are running round the garden playing football or when you are not paying attention when you are mowing the grass and crash into it, then it can take it. Inside the shed we have a very impressive frame a frame which really is actually quite surprising it is in here considering the price of the shed. They have used a robust, 28 mm x 28 mm frame and this is something we really like. It makes the shed very strong and also ensures that it is a structure which is not going to get weak as the years go by. Under your feet and preventing your awesome items from sitting in the mud is one very well designed floor. They have used solid sheet boarding just like the roof, but under this they have used pressure treated floor joists that really do help the floor be able to take a whole lot of weight. This floor was something that really did take us by surprise as it really is made with high quality materials. The wood has a very nice and natural look to it, but if you want to keep it this way then you are going to have to give it a coating of wood treatment. You are best doing this shortly after you have installed the shed. Once a year after this a new coating of treatment should be applied, you do this and that gorgeous overlap cladding and the rest of the wood will stay rot free. 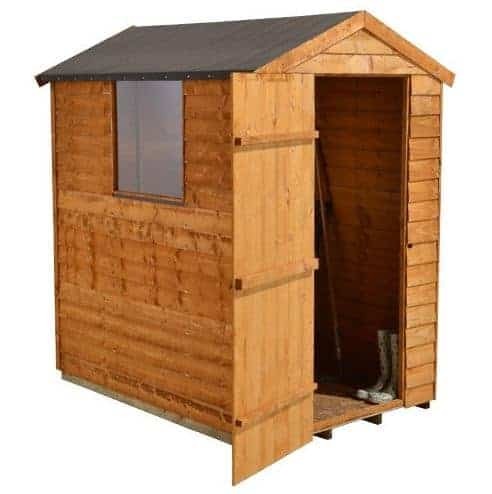 The Hartwood 6′ x 4′ FSC Overlap Apex Shed comes with a ten year anti rot guarantee, but this guarantee does come with a condition and that condition is that you treat the shed properly and look after the shed in the right way. We really like the door that they have used on this shed. First of all it looks great with those large black hinges giving it a bit of style while they prevent the door from sagging. On the back of the door are some strong braces that will give it a bit extra strength which if you have kids who will be in theory putting their outdoor toys in here is something you will be thankful for. They have made sure that you will be able to get things in and out of the shed easily by making the door a little over 2 feet wide. One side of the shed has a 2 mm thick shatterproof window. We really like this window as it is going to allow plenty of natural light into the shed. It is a fixed window so you cannot open it which is something we actually would have liked to have seen. A hasp and staple on the door will keep it closed when you are finished with the shed, but this does not actually lock the door. If you intend on keeping a bike, expensive tools or the children’s prized outdoor toys in here then you will certainly want to at the very least add a padlock. 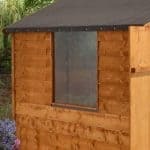 The window does mean that it is possible for people to have a look inside your shed, but the window is not overly large so we would not really worry about it. Still if privacy is a concern of yours then you could always think about adding some blinds or curtains. While there is no doubt that the overlap cladding looks fantastic the way it is as you are required to treat the shed to validate the warranty. We suggest that you have a think about using coloured wood treatment. This way you can give that lovely looking cladding a little bit more style and edge. A few extras are on offer with this shed, first of all we have their Yale branded hasp and padlock set, which is available for £19.99. 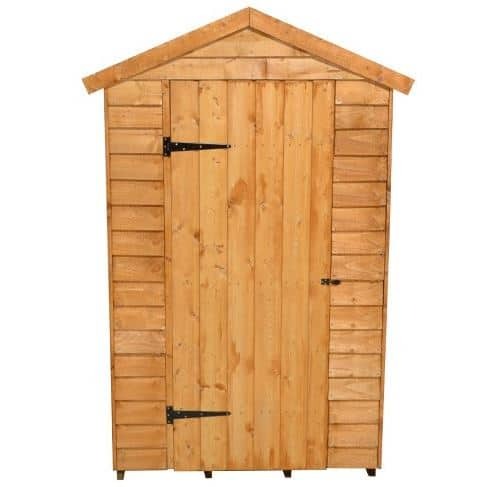 We know this may seem a little pricy, but it is actually very high quality and it goes well with the look of the shed. They also have an alarm system which will give your shed even more security by sounding off an alarm if anyone dares mess with your shed. This does cost £29.99, but if you have something you really want to protect then it is worth thinking about. Even with the low price this is actually a very well made and high quality shed that also has a great look. 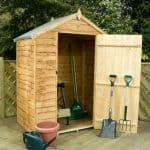 You will get many years of use out of this shed due to the materials that it is made with. While the actual structure is going to be very strong for many years, you must make sure you treat the wood in order to keep it rot free. 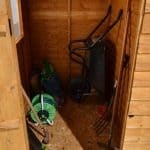 This is not one of the smallest sheds we have seen, but you will have to place your things carefully to get the best out of the space. This is something that even those of you with very basic DIY skills are going to be able to handle. It is a two person job so be sure to get some help and actually do what the instructions tell you. You do this and you will find that you have this built and ready for use in no time at all. You are going to be very happy with this shed and feel as though you really did get a great deal. 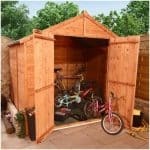 Final Thoughts: The Hartwood 6' x 4' FSC Overlap Apex Shed is one very well made and attractive looking shed that is going to last many years. They really have done a wonderful job in designing this shed so that you are going to get many years of use out of it. It is not the largest shed we have seen that is for sure, but we feel that there is still more than enough space to keep your tools, kids toys, mower and anything else that you are always tripping over in your garden. 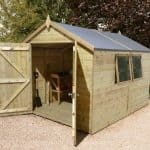 We really do feel that this is one fantastic shed and the fact that it is being sold for such an affordable price makes this something that is very easy for us to recommend.